Promo Podcasts - MIXTOGOMUSIC.COM Stay in the mix with Mix To Go...YOUR ultimate insider's guide to new music, travel-oriented events, dj culture, model culture and nightlife! WED 2-3PM: "Road To AYIA Napa"
WED 3-4PM: "Mix To GO MIAMI"
Classic Pitch WORKOUT" airs monthly. MixToGo.info for the latest. 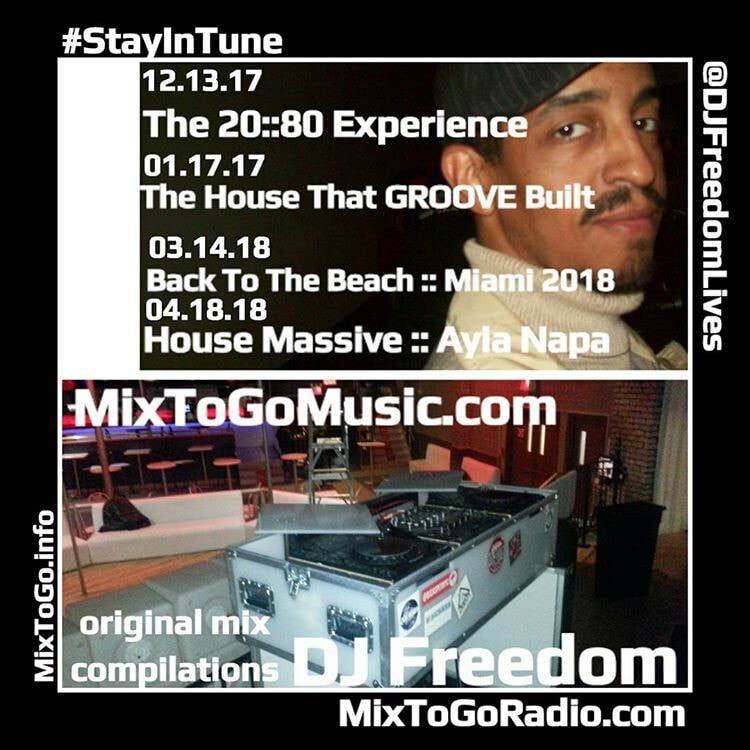 Global Fusion airs every Monday, 7-8pm est on MixToGoRadio.com but depending on where you are in the world that could have been 12 hours ago or 24 hours ago!! This mix show aired LIVE late November on MixToGoRadio.com to much acclaim and support! It was my first live broadcast through a venue in Arizona (and through a venue I didn't have to be at!) Thanks to all who came through and we look forward to the next Core DJ retreat!! This mix of lofty and airy house music anthems from around the world was put together originally in 2000. I redid it in January and decided to post it early February. It's one of my all-time favorite mixes. If you are wondering why I re-worked it I found parts of it to be outdated so I tightened the spots that would cause you to frown after a few listens (like I do, because I am a perfectionist). This deep house mix is something of a "throwback." It was originally done in 2005-6. The songs featured were new and are still favorites among "house heads." This revival was re-edited and remixed with some of the original versions featured in this original mix. DJ FREEDOM worked with DJ BROADWAY when it was original done, hence the title "Soulful Broadway Experience." It at times sounds like it is being done live because that was the original style and feel of this mix. Enjoy! This was the first of seventeen shows I am producing. . These shows are high energy house music but feature winks at new, popular songs, classics and favorites.